Continuity mistake: When Dylan is 'licking' Jamie in the first shot you see the whole blanket, when Jamie starts screaming Dylan suddenly is lying under another blanket and when he lies next to her it is one whole blanket again. Continuity mistake: When Jamie is walking through the airport a man with a yellow shirt overtakes her and walks out of shot. The same man then appears again behind her and tries to overtake her again. Continuity mistake: There is a boat in the background of the jet ski scene which changes with the camera angles. One camera boat is further away, and then the boat is really close. There are also two guys fishing, one with a yellow coat on. In the next angle there's no yellow coat, and then at end of that scene there are 3 guys in the boat. Continuity mistake: At the beginning of the film when Jamie meets her boyfriend after coming off the phone, throughout all of this scene the extras walking past them change or disappear depending on the shot/angle. Continuity mistake: Right at the beginning of the film when Dylan is on his phone and he jumps in his car, as he is about to sit down in the seat a car comes into shot just behind him. By the time he sits down it literally disappears. It couldn't have passed that quickly; two different takes or shots have obviously been edited together. Revealing mistake: Near the end of the film when Jamie is 'talking on her phone' in the bathroom you can see in the mirror that she hasn't actually answered it. Factual error: When Jamie answers Dylan's phone and his ex-girlfriend shouts and then hangs up, you can hear a hang up tone. This isn't possible on a cell phone. 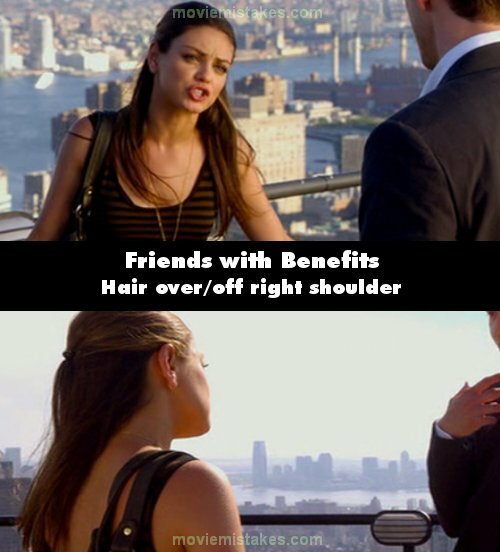 A poster for the film Jamie and Dylan are watching in her flat the night they agree on being friends with benefits can be seen on Dylan's screen in the first scene of the movie.